My girlfriend ordered my Orion XT12G (12 inch solid tube dob with goto) on November 8th for my Christmas present and it was backorder until arriving yesterday. I was shocked to see it show up on a night with no clouds! The assembly of the base was pretty quick and easy, my only concern is the hand controller cradle looks very flimsy (not the cradle its self, the way it's attached). I'll try and make sure I keep it protected as best I can. Next up was swapping the stock focuser out with a Moonlite CR compression ring, dual rate, tri-knob, with shaft lock. Although I've never done this before, it was nice and easy. I removed the secondary to blacken the edges and replaced the collimation screws with a set of Bob's Knobs. Next up was the primary mirror. Before replacing the center spot with a Catseye large white HotSpot, I laid my templet over and was surprised to see the factory mark was off by almost an eighth of an inch! The last thing to go on was my Orion 9X50mm illuminated RACI finder. It's been a long time since I've had to do this and I struggled a bit here. I have all the tools I need including the Catseye set and the Starlight version of Howie Glatter's 635nm laser and TuBLUG. I spent a little over an hour and got somewhat close but I need to go back and do a lot of fine tuning. I was just ready to go out and take in some sights knowing full well that they will only get better once I get everything dialed in. I was in my red zone backyard and not far from the white zone of Oklahoma City. It's not an ideal location due to the trees and clutter of stuff that blocks the view, but far better then the front yard and all of the Christmas lights that my neighbors proudly display. The good news is my girlfriend inherited her family farm that's only an hour away. We are currently working on fixing it up (it sat empty for about 5 years) to use as a weekend retreat. It sits in the middle of 40 acres and butts up against a 126 acre flood control reservoir. It's a green zone location where the Milky Way is clearly seen and will by my primary observing location. There is something truly special about the first view you get to see after spending your time and money on the hopes and dreams of seeing the "big picture"! Due to the limitations of my location I didn't power up any of the electronics at my disposal, I went old school and struggled to find my first target. I say struggled because my finder was not aligned at all and I was tired of looking at my scope, I wanted to look through my scope! I placed my new ES 82* 30mm into the focuser and eventually found the Orion Nebula. "Hello my old friend" was what I thinking as I soaked in the amazing view! I thought it was a fitting target based on the manufacture I entrusted my return to observing with. A quick star test confirmed that my collimation was off, but the views were still very rewarding to me! I only managed a few other quick views before calling it a night as it was after midnight when I carried my new pride and joy out to see the wonders of the night sky. I hope you enjoyed this mini review and I'm sure you will hear more from me as I dive back into the deep end of the pool. I still have a smile on my face this morning as getting back into observing was long overdue for me. Clear skies and Merry Christmas to all! This just makes me fantasize about my 12.5" that I am building. I can't wait to get it finished! Your post brought back to me the night I took my newly built 15-inch F/4.5 Dob outside to try it on the moon, Saturn and deep sky objects for the first time. You'll enjoy how nebulae and galaxies will appear in large numbers through it at a dark site, and star clusters will resolve into stars. As for collimation, a sight tube and Cheshire eyepiece will be more than adequate, and never need batteries or adjustment. I use them to keep my 10 and 15-inch F/4.5 Dobs in perfect collimation every time I set them up. Since you have a F/5 Dob, it pays to check the collimation every time you set up. You may or may not want to get a coma corrector for it later, but for now enjoy the views before embarking on acquisition of a set of eyepieces and or filters that are best for you. Merry X-mas! I have the exact same scope, its a great instrument and should give you plenty of great views! I had my XT12g for almost five years, and it gave me countless memorable observing sessions. Out under a dark sky, 12” of aperture is a powerful scope and could keep you satisfied for a lifetime. There are some good threads around about modifying your dob, and will increase your satisfaction with using it. at i'm sure) you will enjoy the scope. clear skies! Umm.....it's not Christmas yet, why are you looking through it? Just sayin'. Congratulations on your new Scope! I have the 12" Orion as well (Truss, but the same thing otherwise). I have seen two other instances where optical quality on this model was excellent, and my own has perhaps the best mirror I have seen in a mass market dob. Star test with 33% obstruction shows an identical secondary shadow breakout, and the mirror had no zones or turned edge, and the smoothness was quite good. In other words, by anyone's measure, the mirror in my own sample is a really fine mirror. If yours is in the same category for quality, be prepared for some awesome planetary views. The 12" easily put up better planetary views than my 6" Astro-Physics Apo and my C14. Wiews with 31mm Nagler and MPCC Coma Corrector are wonderful (I use the MPCC because it is 1x and while maybe not quite as sharp as the Paracorr, that 1x is important when trying to get the largest field possible out of todays very expensive wide field eyepieces. I had fantastic views with my 12" and it is my favorite larger aperture telescope ever. It does everything with excellence. I hope you enjoy yours as much as I enjoy mine. Thanks for posting this. I am right behind you! My XT12g shipped Friday and will arrive this coming Friday. I will definitely check the center spot on my primary after reading that yours was off (I have read this about others too). 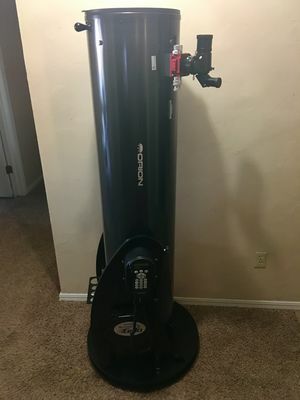 This will be my first "big" telescope, and my first dob, so I am really looking forward to it. 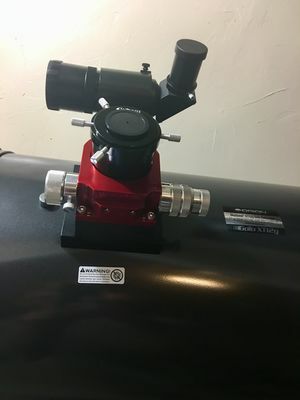 Like you, I have a series of upgrades planned (Astrosystems secondary, secondary dew heater, flocking, fan with baffle, Bob's Knobs, milk jug washers) that I will begin working on when it arrives. And to everyone living in the southeast, I apologize for all the clouds and rain arriving with my new telescope! I need to make a major correction to my post above... As of today, she is no longer just my girlfriend. She is my fiancé!!! I got to play with one (one of the members in my Astro Club has one). I really dig that scope. looking at Saturn, it was super sharp, I felt it was quite a bit sharper than my 12 inch SCT. If I didn't have the LX200, I would be getting that for my larger aperture scope. Sometimes I do consider selling off the LX200 to get a large goto dob. .. Looking forward to updates. This is one of my target future scopes so I am dying to hear your experience both with the optics and the Goto. It's been cloudy since the first light... I'm going to fine tune my collimation over the next couple of days so I'm ready when it clears up. I will say that the push to feel is not quite as smooth as I remember my XX12i, but not as bad as I was expecting with the motors either. Let me see if I can clearly what I mean. When moving it by hand, it's still smooth but there is a bit of backlash when you get to your target. So you need to overshoot it a bit so that it settles on what you hoping to observe. Don't take this as a negative as I'm impressed that the motors don't really seem to be a drawback to manual motion; it's just an observation. Since I have not had the chance to use the goto or tracking so I can't comment on that yet. Edited by ibwaldo4sure, 23 December 2017 - 07:37 PM. I thought there were clutches you released to disengage the motors. No? Nope, just grab and move. Now working on similar upgrades, may i revive the post and ask what would be the best method/matterial to use in secondary mirror side (and back?) blackening? I've used black/black India ink. I had posted, but I deleted it after realizing that your scope does not have the same system as the XX12G. I would guess that your system is behaving correctly though. On the XX12G, the drive motor has springs on it that help isolate the worm wheel gear from the shock of the motor starting up and stopping during a slew. On mine (the XX12G) when I let go, the scope will have a tendency to spring back slightly because when I push the scope, some of the energy goes though the worm wheel and deflects the worm gear and motor against the shock isolation springs, and when you stop, the springs push the motor back to position, which can transmit a bit though the gear and you get that little spring back motion. On mine, I can loosen the clutches and this does not happen, but it appears that in the picture, your scope does not have the same clutch setup as the XX12G does. If it uses the same spring dampening on the motor though, I suspect that this is what you are seeing. Edited by Eddgie, 24 July 2018 - 05:21 PM.